Powers/Abilities: Epoch is the guardian of cosmic awareness, the ability to be conscious of all knowledge in the universe, but she has yet to master this ability and requires time to solve specific questions. Epoch can teleport, fly, alter her appearance, and communicate using telepathy. Her power is potentially infinite when she masters her abilities. History: (Quasar#27) - Epoch lay within the womb of her "mother" Eon, who had recently been slain by Quasar to protect Eon's cosmic awareness from Maelstrom. When Thanos assaulted Eon's body, Epoch was unable to hatch from her egg, and contacted Quasar with telepathy to release her, to keep her from being stillborn. Quasar saved her, and she relayed a message to him from Eon in which Eon placed Epoch in her care. Quasar became Epoch's "godfather." (Infinity Gauntlet#2) - Epoch (manifesting an appearance like that of Eon) communicated telepathically with Adam Warlock, who brought the threat of Thanos and the Infinity Gauntlet to her attention. She summoned Quasar to join her on a mission. (Infinity Gauntlet#3) - Epoch brought Quasar with her to a meeting of the great cosmic entities, summoned together by Adam Warlock. The Living Tribunal and Eternity both withdrew from the assembly, but Adam Warlock convinced Epoch and the others to follow his directions in confronting Thanos. (Infinity Gauntlet#5) - Epoch joined with the assembled cosmic entities to oppose Thanos, only to be bested by the Infinity Gauntlet's power and imprisoned. (Infinity Gauntlet#6) - When Nebula claimed the Infinity Gauntlet, she undid Thanos' earlier actions, forcing her to combat Epoch and the other entities, but managed to imprison them again. When Adam Warlock claimed the Infinity Gauntlet, he set Epoch and the others free. (Warlock and the Infinity Watch#1) - Epoch (still manifesting as Eon) attended the trial of Adam Warlock, in which the Living Tribunal determined that the six Infinity Gems would no longer function together. (Quasar#32) - Quasar asked Epoch to investigate his employee H.D. Steckley and determine if she was connected to Moondragon. (Quasar#33) - Quasar interrupted Epoch's meditations to ask for information on the Shi'ar, but Epoch could not multitask, and knew nothing of the Shi'ar off the top of her head. When Quasar was lost in space after a battle with the Imperial Guard he asked Epoch to help him regain his direction, but she had to take the time to study the star configuation before she could help him. (Quasar#34) - When Earth's sun was threatened by sunspots caused by the Shi'ar stargate being repeatedly activated, Epoch emerged through a portal in Quasar's cape to study the sunspots herself. She identified them as anti-matter and attempted to study the problem, but was only able to identify the problem for Quasar, not attempt a solution. Quasar asked her if she could contact other cosmic beings for help, but she replied that she had always been contacted by them in the past, and did not know how to contact them herself. Quasar decided to attempt to shunt the anti-matter into the Quantum Zone, though Epoch did not believe there was much hope in this endeavour. When Binary arrived to save the sun, Epoch sent her after Quasar, and she ultimately removed all of the anti-matter. (Quasar#35) - Epoch helped direct Quasar to the vessel of the Mourners, then later informed him that she had solved his query regarding H.D. 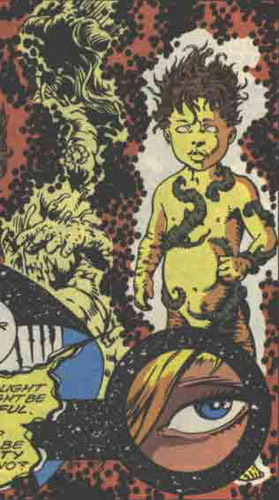 Steckley: she was not Moondragon, but was interrupted by Quasar before she could elaborate further. Quasar asked Epoch to investigate the disappearance of billions of Kree souls, and she directed him to the location of the Soul-Eater, which had absorbed them. (Quasar#36) - After reaching the Soul-Eater, Quasar asked Epoch what it was. She replied that she would get back to him when she found out. (Quasar#37) - Epoch relayed a message to Quasar from Captain America asking him to find the cosmic entity Eternity. 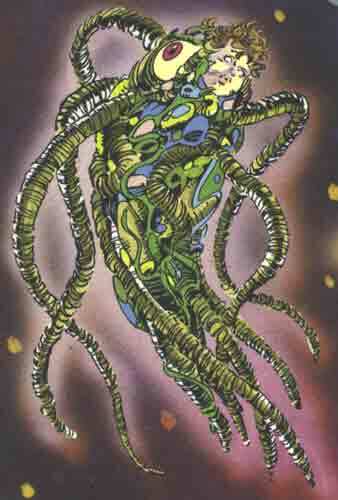 With the help of the Contemplator, Quasar journeyed to the Dimension of Manifestations, where he learned Epoch had received M-Bodies in the past, but she had not known of the dimension's existence itself. When Quasar was assaulted by the entity Anomaly he asked Epoch for aid, but she knew nothing of tactical strategies. (Quasar#39) - As he prepared to wield the Ultimate Nullifier, Quasar asked Epoch for help, but she knew nothing about it. She directed him to the University of Rus, and assumed a humanoid form in order to interact with the locals. Epoch studied the university's data on the Ultimate Nullifier, and informed Quasar that while little was known, every entity who wielded it had been killed in the act. (Quasar#49) - Quasar met with Epoch to tell her of his adventures with the Star Brand, and to ask her to help find his missing girlfriend Kayla Ballantine. Epoch inteded to remain at the University of Rus until she had amassed all of their knowledge, then move on to other worlds. Quasar visited her at the university later to ask for help in curing his mother of cancer, but no one at the university could help him. Quasar stormed off in anger. (Quasar#50) - Quasar apologized to Epoch for his behavior earlier, and Epoch told him that Kayla was back in New York. (Quasar#52) - When Quasar was battling the Geometer, he turned to Epoch for help, and Epoch was able to tell him the creature's origins. (Star Masters#1) - After Quasar was contacted by the Charter, he asked Epoch to check on their credentials. Epoch confirmed for him that they were a reputable, benevolent organization. (Avengers Infinity#1 - BTS) - Epoch went to explore the Crab Nebula, placing her out of contact with Quasar. (Marvel Universe: The End#4) - Epoch was among the cosmic entities summoned by the Living Tribunal to assess the threat Thanos posed after obtaining the power of the Heart of the Infinite. (Marvel Universe: The End#5) - Epoch joined with other cosmic entities and champions of the universe in opposing Thanos. (Marvel Universe: The End#6 - BTS) - Epoch was bested along with the others, and Thanos destroyed the universe, only to restore all to normal after determining he did not want to retain the Heart of the Infinite's power. Comments: Created by Mark Gruenwald, Greg Capullo and Keith Williams. An epoch is a unit of time smaller than a period, as opposed to an eon which is an incalculable set of time; hence, Epoch is not on the same scale of power as her "mother" Eon yet.